Emily Belter’s expertise focuses on assessment and intervention of voice disorders. She is particularly interested in voice therapy for those individuals with Parkinson’s disease and is trained in the Lee Silverman Voice Treatment protocol as well as the SPEAK OUT! program. Throughout her professional career, she has obtained extensive experience in the assessment and treatment of communication, cognitive and swallowing disorders in adults. Emily Belter serves a clinical supervisor for the UWM Speech and Language Clinic. 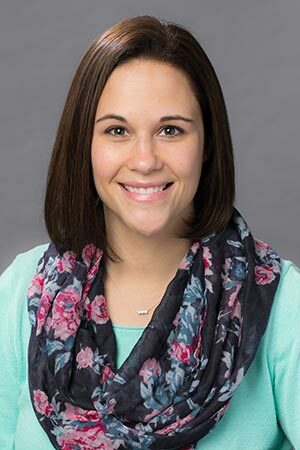 She supervises graduate students in the on-campus clinic, teaches courses related to voice disorders as well as the provision of speech language pathology services in the medical environment. She also serves as the medical externship coordinator and is responsible for supporting students during their medical externship experiences. She also assists students in obtaining their state licensure to begin their careers as speech language pathologists. Emily Belter’s professional experiences include treatment of communication, cognitive, swallowing and voice disorders in multiple settings including acute care hospitals, outpatient therapy, inpatient rehab programs, brain injury units, home health settings, subacute rehabilitation centers and long-term care facilities. Award for Continuing Education (2016) American Speech-Language-Hearing Association (ASHA).